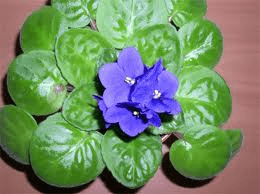 African violets are common houseplants that bloom in a variety of shapes, including bell-shaped blossoms, double blossoms and star-shaped blossoms. They also have a wide range of foliage types, including standard plain leaves, scalloped leaves and ruffled leaves. No matter what kind of African violet you have, when it begins to outgrow its current pot, it’s time to replant or transplant it into a larger pot. 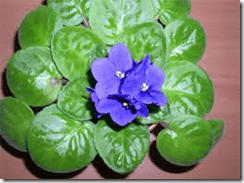 Wait until your African violet is finished with its blooming cycle. You can transplant them while in bloom, but their blooming cycle may be cut short. Tap the sides of the pot to remove the soil and plant from the container. Gently remove some of the loose soil. Plant the African violet to the same depth as it was planted before. Always use potting soil labeled for African violets, common in home and garden centers. Use a pot that is a slightly wider than the previous pot and has a at least one drainage hole. In general, you need a pot with a diameter that is one-third the leaf span. Water your transplanted African violet so that the water drains out the bottom of the pot. Discard any extra water. Transplanting is a good time to divide large, overgrown African violets. Separate the soil from the roots and cut through the roots and crown with a utility knife to divide the plant into smaller section, each with some of its own roots. Plant them in premoistened soil, but then let the soil dry out for two weeks so the plant can recover from the division.